Nasser Ahmed Muthana, known in jihadist circles as Abu Muthanna al-Yemeni, is a British propagandist, recruiter, facilitator, and foreign fighter for ISIS and an internationally designated terrorist. Muthana often encourages fellow Muslims to make hijrah (migration) to ISIS-held territory,Abul-Muthanna Yemeni, Twitter post, June 29, 2015, 8:09 a.m., https://twitter.com/mistyvt_the/status/615492325398192129. and has directed viewers to his private messaging account on Surespot.Abul-Muthanna Yemeni, Twitter post, June 29, 2015, 7:13 a.m., https://twitter.com/mistyvt_the/status/615478067348271104. 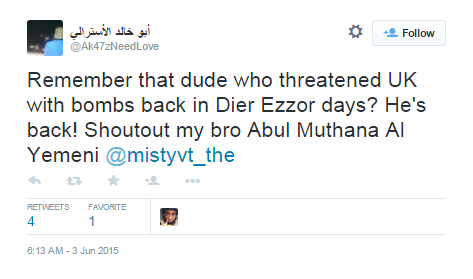 He has also published incendiary and violent messages threatening the lives of kuffar (nonbelievers). In 2014, Muthana appeared in an ISIS video in which he propagandized for the group and told viewers that its fighters “will even go to [fight in] Jordan and Lebanon with no problems, wherever our sheikh [Abu Bakr al-Baghdadi] wants to send us.”“Abu Muthanna al-Yemeni from Britain - ISIS ‘No Life Without Jihad’ Video,” LiveLeak, accessed July 8, 2015, http://www.liveleak.com/view?i=6a5_1403639105#u4qsCO6H0hJxZMlb.99. Muthana is part of a network of English-speaking recruiters and facilitators. On Twitter, U.K.-born recruiter Raphael Hostey (a.k.a. Abu Qaqa) calls Muthana “a beloved brother” who has “been here since I entered Syria.”Qa’qa’ al-Baritani, Twitter post, June 5, 2015, 3:39 a.m., https://twitter.com/an_Najdee/status/606726996111048704. Neil Prakash (a.k.a Abu Khaled al-Cambodi) also references Muthana, and touts Muthana’s violent history.Abu Khaled the Australian, June 3, 2015, 6:13 a.m., https://twitter.com/Ak47zNeedLove/status/606041016861343744. Before joining ISIS, Muthana had been on track to study medicine, and had received offers to study at four U.K. universities. He was last seen in the United Kingdom in November 2013.Tom Whitehead, Claire Duffin, Philip Sherwell and Richard Spencer, “Iraq crisis: British student identified as recruiting Isis jihadists,” Telegraph (London), June 20, 2014, http://www.telegraph.co.uk/news/worldnews/middleeast/iraq/10916124/Iraq-crisis-British-student-identified-as-recruiting-Isis-jihadists.html. In March 2015, the United Kingdom designated Nasser Muthana under its Terrorist Asset-Freezing etc. Act 2010 (”TAFA 2010”).“Operation of the UK’s Counter-Terrorist Asset Freezing Regime: 1 September 2014 to 31 December 2014,” HM Treasury, March 2, 2015, https://www.gov.uk/government/uploads/system/uploads/attachment_data/file/411231/2014Q4-WMS.pdf. On September 28, 2015, the United Nations added Muthana to its list of Al-Qaida Sanctions List of individuals.“Security Council Al-Qaida Sanctions Committee Adds Names of Four Individuals to Its Sanctions List,” United Nations, September 28, 2015, http://www.un.org/press/en/2015/sc12059.doc.htm. @mistyvt_theAbul-Muthanna Yemeni, Twitter, accessed July 1, 2015, https://twitter.com/mistyvt_the. Abu Al-Yemeni Muthana “Security Council Al-Qaida Sanctions Committee Adds Names of Four Individuals to Its Sanctions List,” United Nations, September 28, 2015, http://www.un.org/press/en/2015/sc12059.doc.htm. abulmuthannaAbul-Muthanna Yemeni, Twitter post, June 29, 2015, 7:13 a.m., https://twitter.com/mistyvt_the/status/615478067348271104. Abul-MuthannaAbul-Muthanna Yemeni, Twitter, accessed July 1, 2015, https://twitter.com/mistyvt_the. Abul-MuthannahQa’qa’ al-Baritani, Twitter post, June 5, 2015, 3:39 a.m., https://twitter.com/an_Najdee/status/606726996111048704. 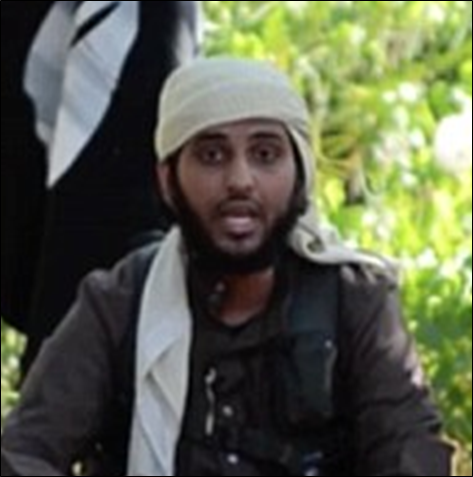 Abu Muthana Al Yemeni“Operation of the UK’s Counter-Terrorist Asset Freezing Regime: 1 September 2014 to 31 December 2014,” HM Treasury, March 2, 2015, https://www.gov.uk/government/uploads/system/uploads/attachment_data/file/411231/2014Q4-WMS.pdf. Abu Muthanna al-YemeniTom Whitehead, Claire Duffin, Philip Sherwell and Richard Spencer, “Iraq crisis: British student identified as recruiting Isis jihadists,” Telegraph (London), June 20, 2014, hhttp://www.telegraph.co.uk/news/worldnews/middleeast/iraq/10916124/Iraq-crisis-British-student-identified-as-recruiting-Isis-jihadists.html. Abdul Muthana“Security Council Al-Qaida Sanctions Committee Adds Names of Four Individuals to Its Sanctions List,” United Nations, September 28, 2015, http://www.un.org/press/en/2015/sc12059.doc.htm. Abul-Muthanna YemeniAbul-Muthanna Yemeni, Twitter, accessed July 1, 2015, https://twitter.com/mistyvt_the. Abu Muthana“Security Council Al-Qaida Sanctions Committee Adds Names of Four Individuals to Its Sanctions List,” United Nations, September 28, 2015, . Abu Muthanna“Security Council Al-Qaida Sanctions Committee Adds Names of Four Individuals to Its Sanctions List,” United Nations, September 28, 2015, . Nasir Muthana“Security Council Al-Qaida Sanctions Committee Adds Names of Four Individuals to Its Sanctions List,” United Nations, September 28, 2015, . Nasser Ahmed Muthana“Security Council Al-Qaida Sanctions Committee Adds Names of Four Individuals to Its Sanctions List,” United Nations, September 28, 2015, . The U.K. Treasury designated Nasser Muthana under its Terrorist Asset-Freezing etc. Act 2010 (”TAFA 2010”).“Operation of the UK’s Counter-Terrorist Asset Freezing Regime: 1 September 2014 to 31 December 2014,” HM Treasury, March 2, 2015, https://www.gov.uk/government/uploads/system/uploads/attachment_data/file/411231/2014Q4-WMS.pdf. The U.S. Department of the Treasury added Nasser Muthana to its list of Specially Designated Nationals.“Counter Terrorism Designations,” U.S. Department of the Treasury, September 29, 2015, http://www.treasury.gov/resource-center/sanctions/OFAC-Enforcement/Pages/20150929.aspx. The United Nations Security Council added Nasser Ahmed Muthanna to its Al-Qaida Sanctions List of individuals.“Security Council Al-Qaida Sanctions Committee Adds Names of Four Individuals to Its Sanctions List,” United Nations, September 28, 2015, http://www.un.org/press/en/2015/sc12059.doc.htm. Nasser Ahmed Muthana, known in jihadist circles as Abu Muthanna al-Yemeni, is a British propagandist, recruiter, facilitator, and foreign fighter for ISIS and an internationally designated terrorist. 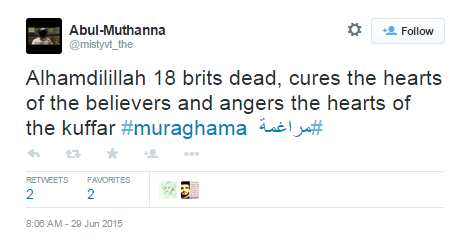 “Alhamdulillah 18 brits dead, cures the hearts of the believers and angers the hearts of the kuffar…” (Tweet)Abul-Muthanna Yemeni, Twitter post, June 29, 2015, 8:06 a.m., https://twitter.com/mistyvt_the/status/615491504027627520. “Man it felt so good to see the rafidha get a taste of their own medicine, may Allah accept him as a shaheed and enter him into Firdows, Ameen” (Tweet)Abul-Muthanna Yemeni, Twitter post, June 27, 2015, 9:56 a.m., https://twitter.com/mistyvt_the/status/614794437437353985. “…Other than implementing the law of Allah […] and fighting the enemies of Allah you see no one who does it like us […]. And we are a state who is implementing the sharia [Islamic law] in both Iraq and Sham. And look at our soldiers, we understand no borders […] we have participated in battles in Sham and we will go to Iraq in a few days and we will fight there […] and come back and we will even go to Jordan and Lebanon with no problems, wherever our sheikh [Abu Bakr al-Baghdadi] wants to send us.” (ISIS propaganda video)“Abu Muthanna al-Yemeni from Britain - ISIS ‘No Life Without Jihad’ Video,” LiveLeak, accessed July 8, 2015, http://www.liveleak.com/view?i=6a5_1403639105#u4qsCO6H0hJxZMlb.99.